Looking at Daff Dome from the parking area, you would never imagine that the west face could be climbed at anything less than 5.12. Yet a splitter finger crack in the middle of the giant golden face goes at only 5.8. Except for a few face moves off the ground, which are protected by a bomber bolt, the entire route is 5.8. While the roof at the start of the second pitch is intimidating, hidden holds make it reasonable. Even the offwidth on Pitch 4 is climbed via great face holds to the right. Which SuperTopo guidebooks include a topo for West Crack? It’s hard to believe that this handsome chunk of granite had no name as late as 1963. Frank Sacherer and Wally Reed, in July of that year, climbed the classic West Crack, one of the earliest Tuolumne climbs. When Valley climbers asked where this gem was, Sacherer hesitated only a moment before replying: “dome across from Fairview.” Within weeks this had been shortened to Daff. The admirable Tuolumne ethic of never using aid perhaps originates from the climb of West Crack (Pratt and Reed, on Fairview in 1958, had used lots of aid, but this was in the Dark Ages and the cracks brimmed with dirt, meaning that jamming was out of the question). By 1963 Sacherer and Reed were superb free climbers and as they stood beneath the west face of Daff they spotted crystals and dikes and knobs and cracks everywhere. This was high-country granite, weathered far more than the smooth walls of the Valley. It seems safe to say that as they roped up they were thinking of a free ascent. Trouble was, about 20 feet above the ground the rock was, for a short distance, smooth and featureless, almost Valley-like. But it posed little problem, going at 5.9. Higher, the climbing proved thrilling and amazingly easy, and pitons could be driven anywhere for protection. 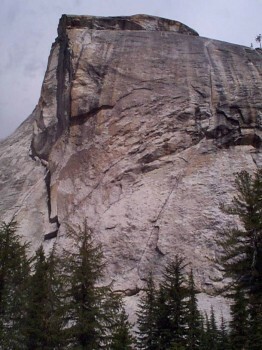 Because Sacherer had a huge free-climbing agenda down in the Valley, he never again put up a first ascent in Tuolumne. One wonders what he would have done had he lived in the Meadows for a few months! Come prepared to wait in line or climb nearby routes. Large cams are needed to protect the fourth pitch or you can run it out. Beware of the possibility that the rope may drag cams into the crack on this pitch. If you have a #11 Hexcentric, bring it and use it at the bottom of the offwidth—not only is it great pro, it also keeps the rope running smoothly. With a 60m rope you can climb the route in four pitches with no difficulty. The crux of the route is the first 30 feet. Clip the bolt with a single locker and stand on thin polished edges, working up to a good crimp. A few easier moves gain the crack, which stays easy for the next 60 feet. For the roof on the second pitch, jam with the right hand and use bomber jugs up and left to work your way through the overhang. This section is easier if you are tall.